Born in the rural community of Manitoba, Canada, Carola's family moved to Winnipeg when time came for her brother to start school. "So, it was off to the big city," Carola said, "where we still live today." Her mother was a seamstress and sewed for other people out of her home and made most of Carola's clothing, which she had no problem with "until I reached my teen years," Carola remembers. Inspired by her mother's talents, she would sit with her and sew clothing as well, but mainly for her dolls. Carola learned to crochet and needle-point. "The needle-point came in handy when decorating jeans with embroidery became fashionable." Carola's parents returned every two to three years for a holiday to their native Germany. "All of our family was still there. So the love of traveling bit me early on as well," Carola said smiling. At the tender age of twenty-one, she decided to live in Germany for a year, staying with relatives for a short time, until she found her own place to live. "The one year turned into six and I had the time of my life in Berlin. I was able to work there and visit my other relatives who lived in the Eastern part of Germany," she recounted. Six years later she returned to sunny Manitoba with her husband and daughter in tow. As with most new parents, she bought her daughter numerous stuffed animals. 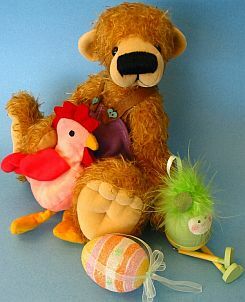 "However, I slowly realized that I wasn't buying these stuffed creatures for her, I'm the one who loved them!" Carola said excitedly. This love took her on a new venture. Even though she was heavily into ceramics for two years, selling mostly at craft shows, she decided to do something a little more manageable. "Plus, lugging around big boxes of ceramics can be very tiresome," she added. "Not that my husband complained, but I'm sure he's happy that I switched hobbies." 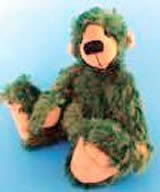 In 2001, Carola ordered a couple of Glorex patterns from Germany and began sewing her first bear. "I was amazed and thought the creation process was immensely fun." When she went on the internet to search for more teddy bear patterns, she was astounded at how many artists popped up and the uniqueness in the designs. 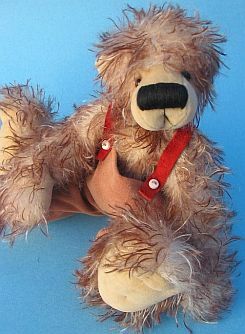 "I have to admit I was partial to German artists because they seemed to give a whimsical characteristic to their bears. 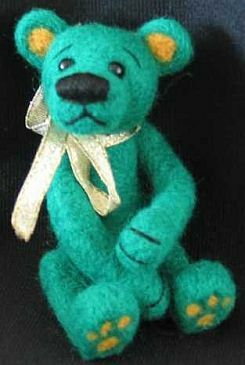 So I took my pattern and started to adjust it in many different ways; gave the bear different arms and legs until I could say that this is my pattern now," she said. By 2002, she started to attend teddy bear shows. The bear-making bug had taken a firm hold on her. 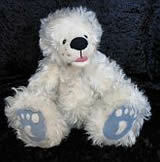 "I was amazed by how many of my past hobbies skills I was able to use in making bears. My knitting and crocheting came in handy for sweaters or hats and embroidery techniques for stitching big bear noses." Inspired to spread the excitement about the Teddy Bear industry, Carola, through contacts on the Net, joined with others and established the Annual Manitoba Teddy Bear Show held in the Assiniboine Park Conservatory. Now in its third year, it has brought the hobby to the area and has become a big success with the artists and collectors. As with most things, where there is a rise, there is sometimes a fall. 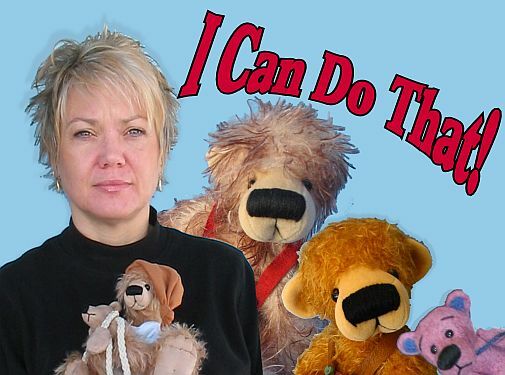 "I think we all go through a slump in our bear making career and I think that is where I was in 2006 after attending the TED worldwide in Muenster, Germany," she recalled. "I had to re-evaluate what I was doing and where I wanted to take my bear making career." 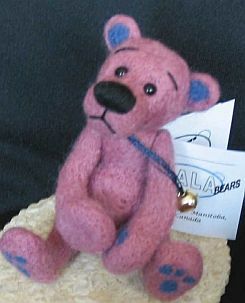 Although the hobby didn't pay the bills, she found such a passion in making bears that she did not want to give it up. Then she realized that out of her "slow phase" came the thought that she really had to make something unique, but in a world of one-of-kinds, she sincerely wondered how to do that. After tweaking some of her patterns, finally Carola came up with a style that she is happy with. 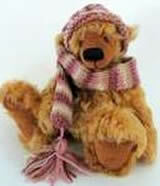 "I've tried to instill the 'cute factor' in my bears, as well as, the innocent look," she stated. "I think I have achieved my own unique style of bear where you can recognize them anywhere. I've kept up the big sculpted feet and big stitched noses but have incorporated needle sculpting their faces." She likes to make bears in the 7 to 10 inch range. "I find they are just the right size to hug, and if you are traveling long distances, they tuck nicely in a suitcase," she added. 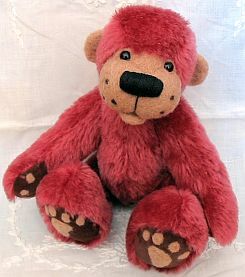 Most all of Carola's bears are made from mohair but then at other times she uses synthetic plush, depending on what she has chosen to create. "Each piece of fabric can bring a different looking bear to life using the same pattern." During a show you may find her sitting beside her table needle-felting, as this is another one of her passions. 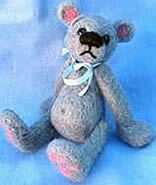 “I needle-felt jointed bears and have incorporated needle-felting in some of my mohair bears too” she stated. Concentrating mainly on making bears, Carola has also delved into designing “artist card” types of tags for each teddy bear. “It gives me a different medium to work with,” she said. She still finds time to spend with her 3 beagles, who, after the children have grown up and left the house, have become her husband’s and her ‘other children’. “The dogs are so active and keep me active when they drag me out for a walk every day,” she remarked.